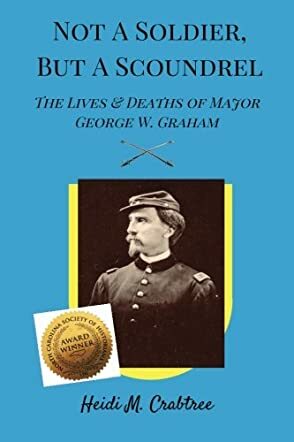 Not A Soldier, But A Scoundrel - The Lives and Deaths of George W. Graham by Heidi M. Crabtree is a significant, well researched book, enough to be memorable amongst the plethora of novels and histories I read concurrently. The chief protagonist of this history is a young volunteer who joins the Union army at the time of the American Civil War, with a rather dubious past that remained hidden, since there were no means of checking the past of a person in those times. Graham, probably by virtue of his flamboyant personality and his ability to tell a tall tale convincingly, was voted by his peers and promoted to a Lieutenant within a day of his signing up. Graham volunteered and was posted in the new ‘Rocket Company’ of the 9th NJ Volunteer Regiment. Shortly after, in an engagement with the Confederate Army along the White Oak River near Onslow, the first dubious incidents of misinformation are seen with Union reports that three Rebel cavalrymen were brought back as prisoners, but the Rebel accounts list no casualties and four Union deaths. Strangely at this time, the Union Colonel reported that there had been smoke at the rear of the column, which was where Graham's artillery followed – the first of a string of arsons which earned Graham the reputation of being a “firebug”, yet not recorded in dispatches. What is even more notable is the fact that the Colonel noted Graham for his assistance in his official report, indicating Graham's ability to cloak his misdoings. The merry history of Graham, by the brilliant pen of Heidi M. Crabtree, who has literally sifted the shifting sands of the times to arrive at the truth about Graham being a scoundrel, continues with flair and with fact battling fiction to a fine ending. Graham soon sported the rank of a Major – how he obtained it is a matter of speculation - but he commanded his troop. Many times charges were leveled against him for false leaves of absence, missing from his command and others, but none could be substantiated. He even managed to become the talk of the town and could strut around like a hero. This book itself appears to be more fiction than fact, because its content is so extraordinary. Wherein lies the truth and wherein the fiction remains something that I think the reader will have to judge for himself. Not only does this history deserve five stars, but it deserves to be seen on the silver screen as a great movie. This book is superbly researched and a perfect example of how truth can be stranger than fiction! Well done.